The North Yorkshire Moors Railway is one of the world's greatest heritage railway experiences with thrills and family fun at its heart. 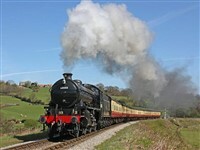 The perfect day out awaits you aboard the North Yorkshire Moors Railway, the world's most popular heritage steam railway. Be transported back to an era when magnificent steam engines ruled the railways; with services running along the 24 mile line, through the heart of the North York Moors National Park and out to the golden sandy beaches of the coast at Whitby. Start your journey at Pickering and discover the history of the Railway in the visitor centre. Board the train for your onward journey to Whitby for some seaside fun.